Hong Kong Street is heating up again, with Teepee leading another wave of eateries coming in the next few months. 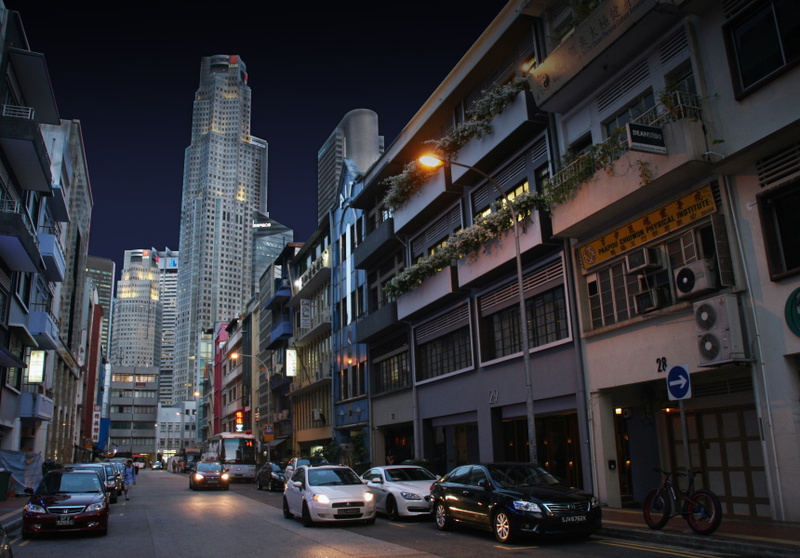 HongKong Street is a charmed location for food. Just on the fringe of the CBD, it doesn’t look like much if you just walk down the street. That is, until you start realising that it’s home to names like Ronin, 28 HongKong Street, Kitchen at Bacchanalia, F.O.C & Vasco. All popular names on Singapore’s dining and drinking zeitgeist. I work on the street, so I was lucky to watch the row of shophouses evolve slowly into what it is today. Working on this street also means that I get first dibs on any new restaurant/bar in the area. There has been a rash of restaurants renovations, but 31 HongKong Street’s Teepee Restaurant and Bar was the first to be complete, with incoming tenants like Katong’s popular Italian joint, Bottega, and Italian Restaurant Amo coming up very soon. Teepee is tucked in the back of the first floor, so there’s a slight air of mysteriousness, without being all “knock-knock” pretentious. I spent a lot of time in the comfy space having lunch, so I can attest to the fact that the place feels hidden away. This photo was from my very first meal in Teepee: The Umami Swiss Burger. 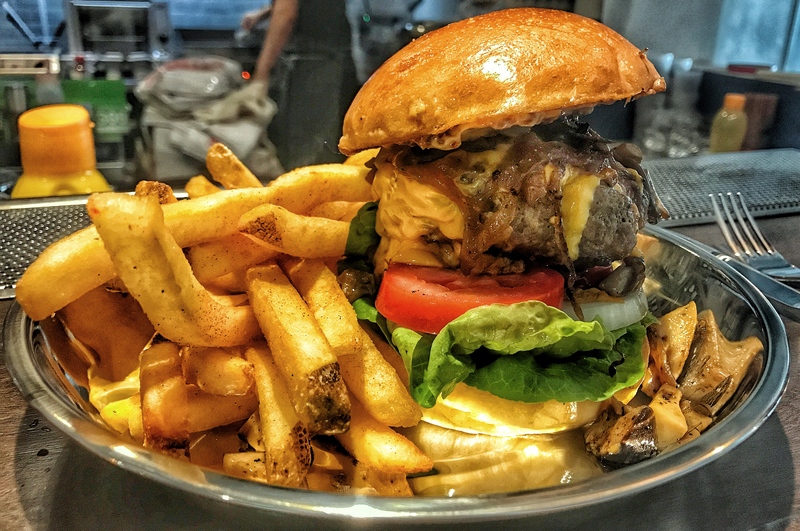 This baby is all about decadence; We’re talking toasty buns and a juicy patty, topped with a melty cheddar and saucy mushrooms. That generous portion of thick, hearty fries are just a bonus reward for braving the caloric assault. I love this dish, and I’ve been bringing friend after friend to Teepee, only to see them order this item themselves with no prompting. It’s a clear winner! If you’re feeling reckless, then the 3 Cheese & Bacon Burger is the one you want to order. 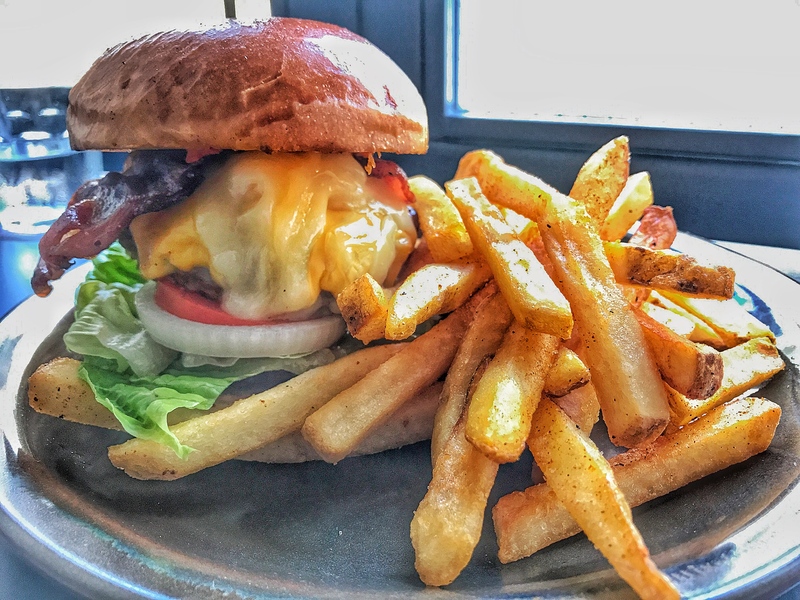 You’ve got that same juicy patty, but the the crispy bacon and 3 types of cheddar will bring you into the danger zone with its hearty mix of fat and saltiness. We’re talking major post-lunch coma induction, so it’s best to have this on a less hectic Friday afternoon! I must say, the thought put into the Donburi items here are above expectations as well. I’ve tried all of the rice bowls, and my top choice is the Truffle Loco Moco Mushroom Bowl. 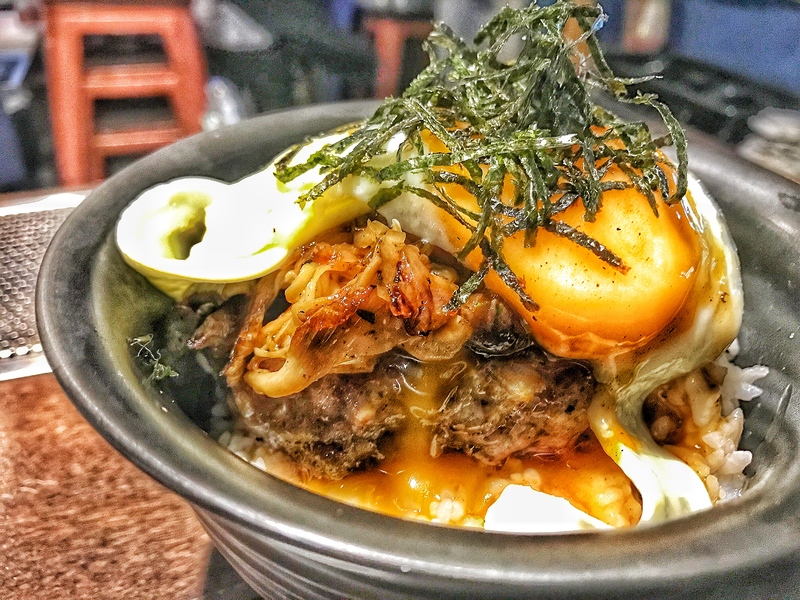 The foundation of this sinful stack is a fluffy bed of rice that’s accentuated by a succulent beef patty that’s adorned with fragrant onions and a runny egg. There’s a major, major flavour burst from the beef, so I recommend cutting a chunk of the beef and eating it with some of the yolk and rice. It’s ultra satisfying when the warmth of the rice comes together with the flavour of beef and the smoothness of the yolk. Coming in a very close second is the Crispy Chicken Bowl. I must say, it lives up to the name. 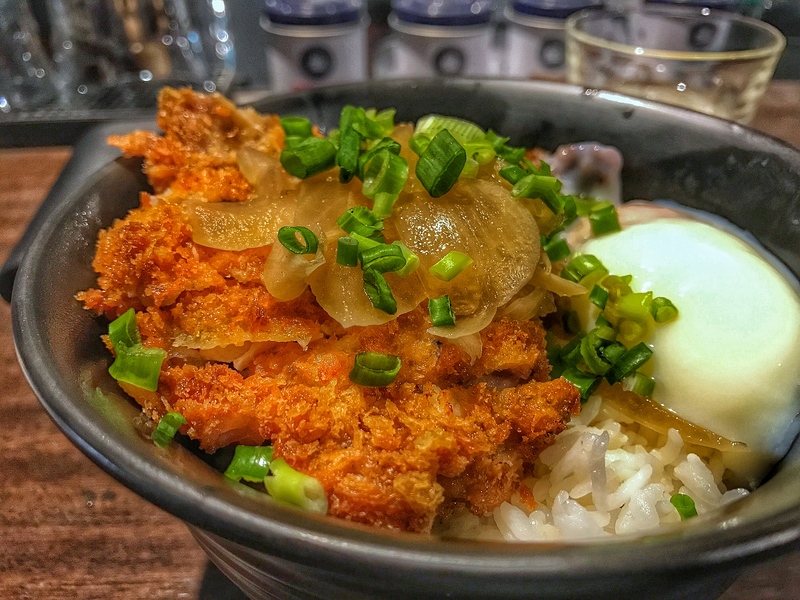 I always skip going for anything “crispy” on a rice bowl because the supposedly “crispy” parts usually end up soggy, but look at that battered chicken. This beauty is crunchy as hell, and when you have that kind of chicken with egg coated rice, then the phrase to describe it is “maximum comfort”. I know Teepee is a bar at night, but I don’t drink on duty, so I get to rate their coffee. Now, if you’re in the market for some dark, robust roast, then you’ve come to the right place. I almost always go for their iced long black, but the Slutty Latte is a smart twist on the conventional latte. Instead just doing a common iced latte, this rendition drops frozen espresso cubes into the milk. As the cubes melt, it cools the drink and releases more espresso into the drink. Say goodbye to diluted lattes, and hello to a drink that gets stronger and stronger as the ice melts! I really like the setup, and the food at Teepee has the potential to become one of HongKong Street’s lunch time greats. The staff are friendly, the food is honest comfort and there’s a fantastic vibe going on in the place. Bring a few good friends, chow down on a burger or two and have a good time. After all, isn’t that what a lunch hour is for?